As a result, last fall's fear of policy mistakes and #GrowthSlowing has been replaced with performance anxiety. Buy the dips is the new battle cry. Risk-on is the only appropriate position. It's up, up and away from here. Party on, Wayne! Although I am a card-carrying member of the-glass-is-at-least-half-full club and I recognize that the recent run for the roses is likely a "correction of the correction" given the Fed "pivot" and the expected trade deal, I am struggling a bit with the current pedal-to-the-metal mentality. First and foremost, on my list of concerns is the issue of #GrowthSlowing. To be clear, this isn't something that is expected to happen, it is happening. Now. Everywhere. Economic growth estimates are falling around the world. And frankly, I don't have a lot of faith that even a "tremendous" trade deal will cause this trend to turn on a dime. And yes fans, I am fully aware of the fact that Ms. Market looks "ahead" and not at what is happening now. My problem is that investors seem to be looking only at the bright side here. As in, a trade deal might not happen this month, this quarter, or even this year. Oh, and just because a trade deal gets done doesn't mean the global economy is going to suddenly reverse course. Then there is another pesky little problem: earnings. Sure, analysts have been busy cutting their estimates. The bulls say the new expectations present a "low bar" for companies to hop over in the coming quarter. But remember, analysts are traditionally too optimistic, not too pessimistic. Next there is the issue I'll call "course correction firepower." Or in this case, a lack thereof. But here's the rub. Both stimulative parties appear to be either low on, or completely out of ammo to fight a slowdown - especially if it occurs in the next year or two. Sure, the Fed could announce another round or two of QE. The only problem is the current Fed "balance sheet" (the amount of bonds they hold on their books) is still pushing $4 trillion. And Guggenheim estimates it would take another $4 trillion of QE to create the proximate effect of cutting rates by 5.5%. Next up on the list of things causing me a modest degree of indigestion is my "Primary Cycle" indicator board shown below. In case you aren't familiar, this is a group of my favorite, big-picture market models I use to try and keep me in tune with the overall environment. 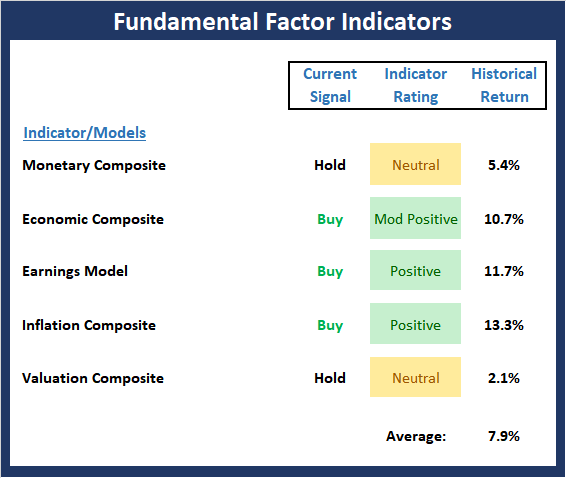 To review, each week I show the current "signal" and "rating" of each model and then what the S&P's historical return has been when the model is in its current mode (historical return data courtesy of Ned Davis Research). 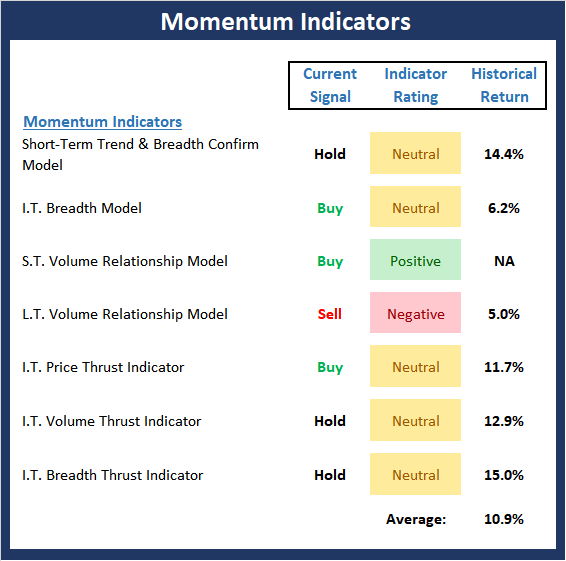 This board includes a model of Leading Indicators (indicators that have historically "led" big moves in the stock market), my Intermediate-Term Trading Model (a model-of-models focused on trend/momentum built to trade the intermediate- to longer-term market cycles), a Risk/Reward Model (a model-of-models designed to illustrate the risk/reward environment), my Desert Island Model (a model-of-models designed to be the "one model to rule them all"), a Global Risk Model (a Risk-On/Off model based on global markets), and an Fundamental Factors Model (a model-of-models covering the state of interest rates, the economy, inflation, earnings, and valuations). It will suffice to say there's a lot of stuff covered here. 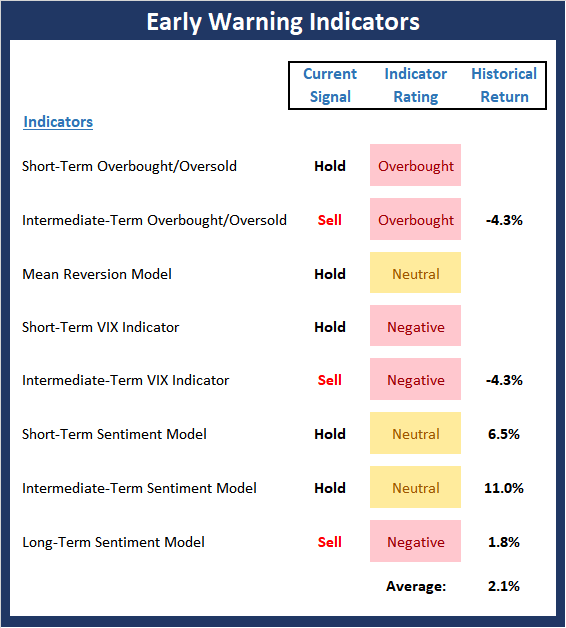 In developing this board, my goal was to create a robust set of indicators/models covering all facets of market analysis to provide the state of the prevailing market environment. One glance at the board tells the whole story here. In short, the question is, where's all the green one would expect in a strong stock market environment? Stocks are rockin' and everybody is excited about the potential gains. Nobody wants to miss out. Advisors are clamoring for "more return." But my Primary Cycle board appears to be, well, less than enthused. There are six models-of-models on this board. Two are on a buy signals. Only one indicator rating is positive. 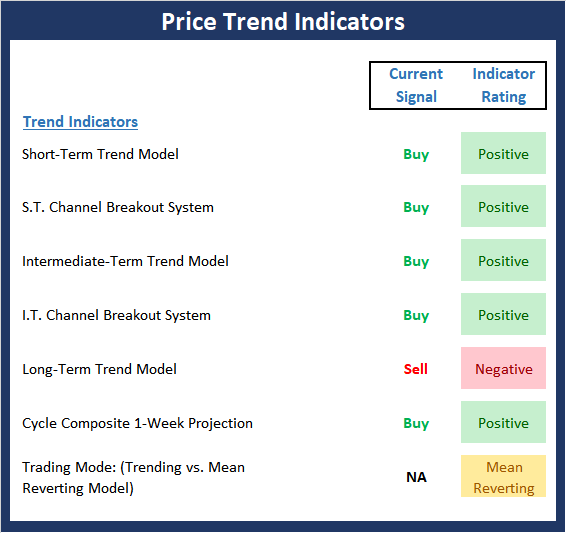 Three models are on sell signals. And the reading of my "Desert Island" model is outright negative. What the heck is going on here? Frankly, this just doesn't happen. 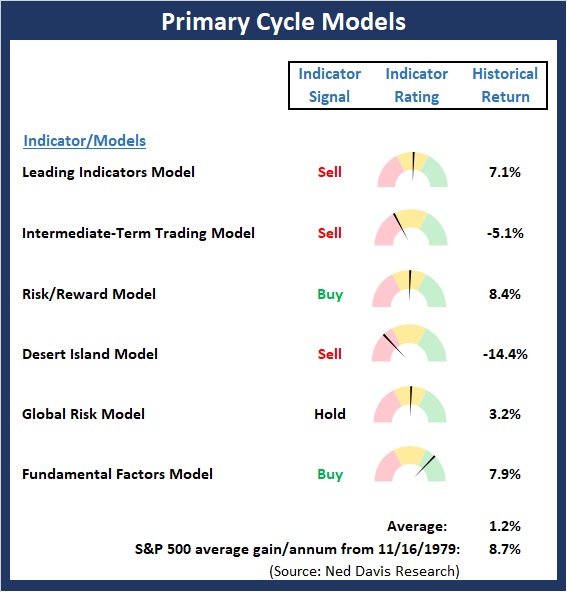 The Primary Cycle board usually confirms the "primary" trend - that's its job! And since stocks are ripping, I again wonder, why aren't more indicators green? Maybe the models have it wrong and are simply out of sync - all at the same time. It could happen, right? The bottom line here is something appears to be out of whack. Maybe the models are in a funk. Perhaps the models will perk up in the coming weeks as stocks move to new highs. Or... Maybe, just maybe, things aren't quite as robust as the recent price action has folks believing. It has happened before. In any event, this indicator board continues to give me pause. This indicator board causes me to scratch my head, raise an eyebrow, and furrow my brow. And this indicator board tells me to keep a little (key word) powder dry - you know, just in case. And while being a little (there's that word again) concerned doesn't seem to be a popular stance right now, staying in tune with "conditions" is the way I like to operate. What if I'm wrong, you ask? What if the market ignores the models and simply powers higher from here? In short, this would likely produce new momentum buy signals, which would force me respect the price action and to put that small amount of dry powder I'm keeping in reserve to work. But for now, I'm hailing from Missouri and I need this market - and the indicators - to "show me" a little something more. Although it is difficult to see, there was once again some modest improvement in the "Primary Cycle" board this week. However, there can be no denying that the overall state of this indicator board - a board designed to give me the "state" of the market in a single glance - is less than stellar. In short, this tells me that while folks continue to pile back into stocks, the overall status of the market isn't as strong as the recent price action might suggest. This week's mean percentage score of my 6 favorite models improved to 50% from 47.9% last week (Last 2, 3, & 4 weeks: 45.4%, 40.3%, 44.2%) while the median held steady at 50.0% from 50% last week (Last 2, 3, & 4 weeks: 46.3%, 42.5%, 40%). Given that the prior week's pullback was quickly erased with last week's advance, one could argue that the 5-day decline seen from 3/4-3/8 was a "pause that refreshes" and that the next stop is the old highs. The good news is the S&P 500 and NASDAQ indices appear to have broken out above the key resistance zone. The bad news is the S&P's "breakout" is less than convincing at this stage and the rest of the major indices are not close to confirming. The Momentum board is largely neutral this week. However, it is worth noting that the historical return of the S&P 500 has been above trend given the current readings indicator board. As I've been saying, due to the fact that momentum was very strong during the initial phase of the rally, this remains a buy-the-dip environment. The bottom line is the Early Warning board, which did a nice job of warning us that the table had been set for a modest counter-trend reversal, continues to flash warning signs. Personally, I view the "state" of this board as a yellow flag from an intermediate-term perspective. I.E. One can stay seated on the bull train, but it might be a good idea to have a path plotted for the exit if conditions suddenly change. To be sure, there is no bad news on the Fundamentals board. However, it is worth noting that the Economic, Monetary and Valuation Composites (composites are combinations of models) as well as the Earnings models have all slipped a bit recently - just not enough to change either the signals or the model ratings. All in, the board continues to suggest that the backdrop remains constructive. However, could the current "slippage" in the model readings continue or accelerate, we could see stocks begin to discount a further slowdown. But for now, the bulls have enough to justify a continued advance, albeit at a more modest pace.